Updated 11/04/16 - Currently no job openings at Fountainhead Montessori School. 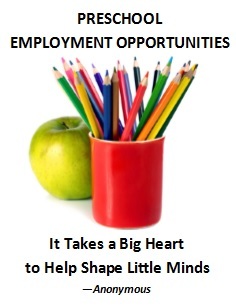 Several positions with various ages (18 months to 6 years) available. Complete a minimum of 12 semester units of course work in early childhood education or child development, including at least one course of at least three semester units in each of the following core areas: · Child/human growth and development · Child, family, and community, or child and family relations · Programs/curriculum. Email cover letter and resume to Katie at HR@fms.org.